Buying presents for kids can be extremely overwhelming. 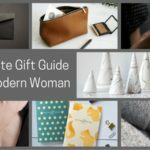 There is so much to choose from, kids usually already have a ton of stuff, and you want to give them something that will continue to provide joy as the years go by. 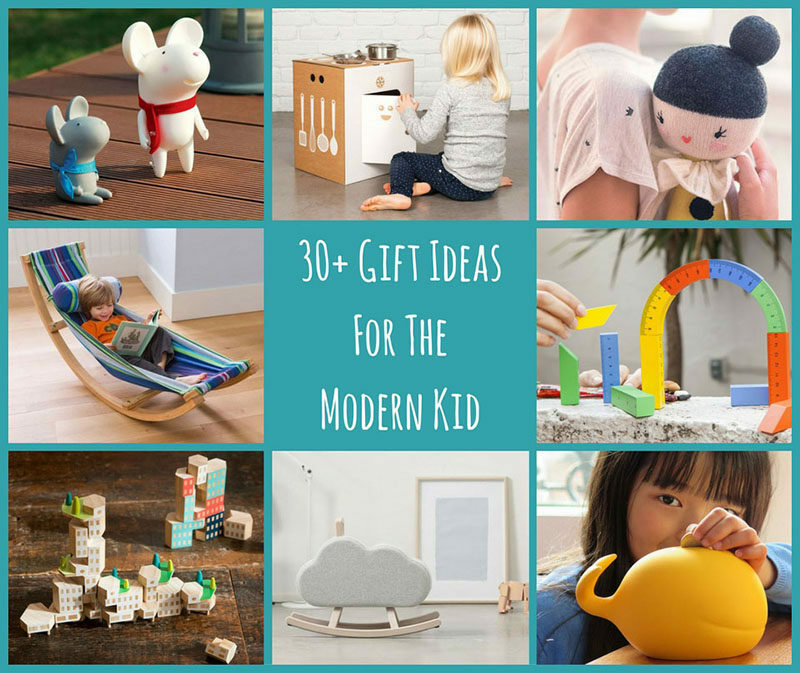 To help make gift giving a little easier, we’ve compiled a list of gifts for kids that are modern, beautiful, and are likely to be treasured for a long time after it’s been given. 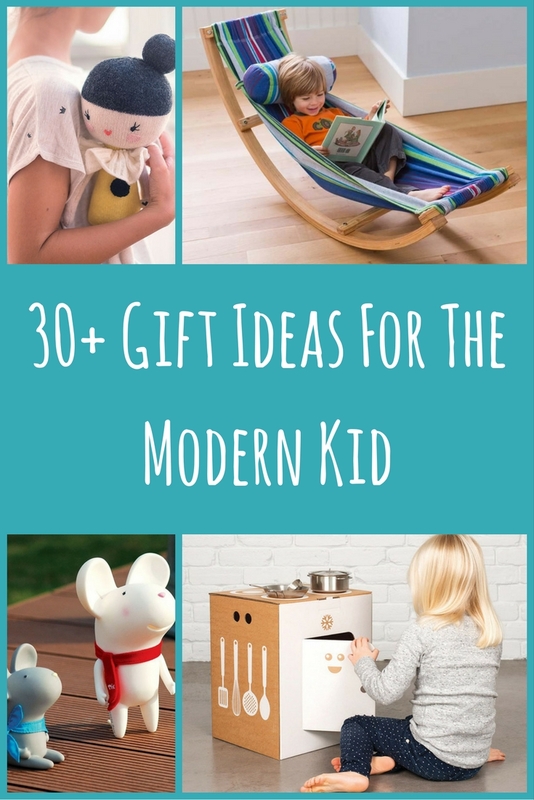 Here are 30+ gift ideas for the modern kid. 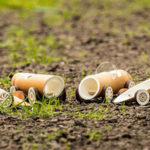 Wood toys are a wonderful alternative to plastic ones. Wood is durable, safe, long lasting, and looks much nicer strewn across the floor than plastic. 1. 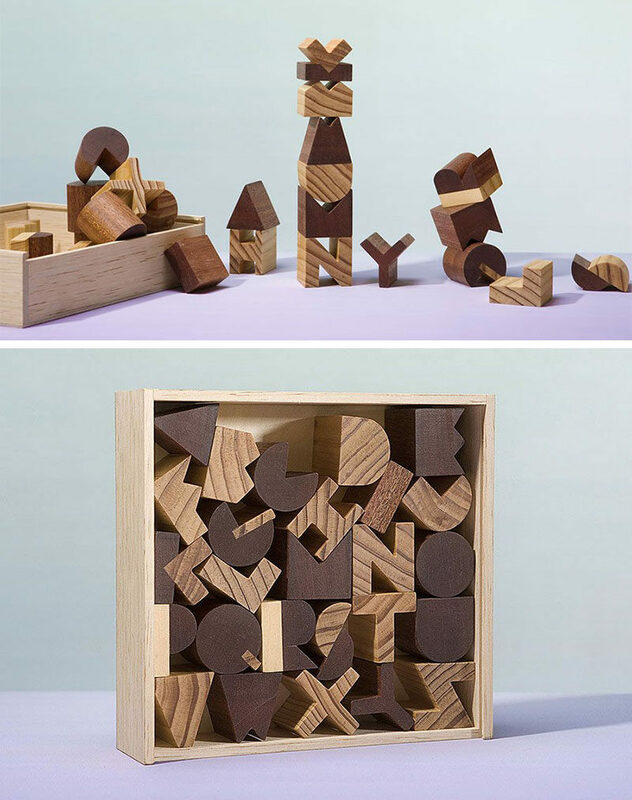 These wood toys have magnets on them to allow for endless configurations and hours of play. The cars are also painted with chalkboard paint so they can be drawn on and customized over and over again. 2. 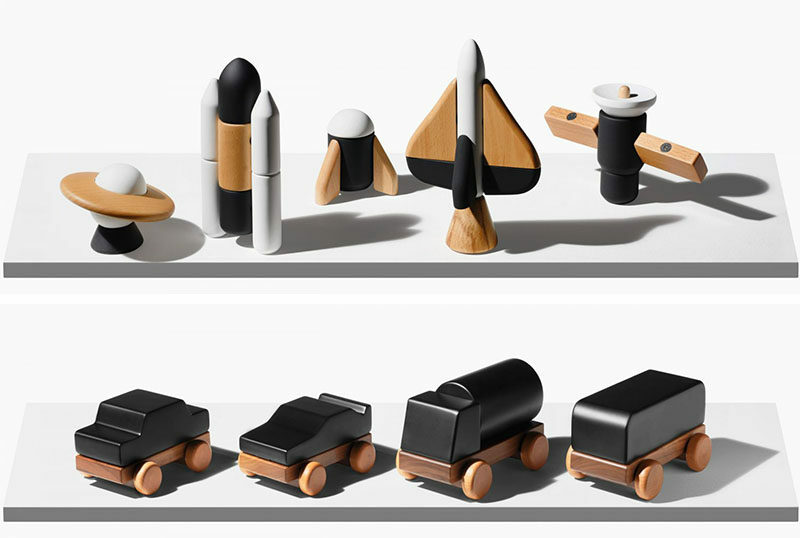 If any of the little people in your life are into boats, islands, or helicopters these wood toys are sure to be a hit. 3. 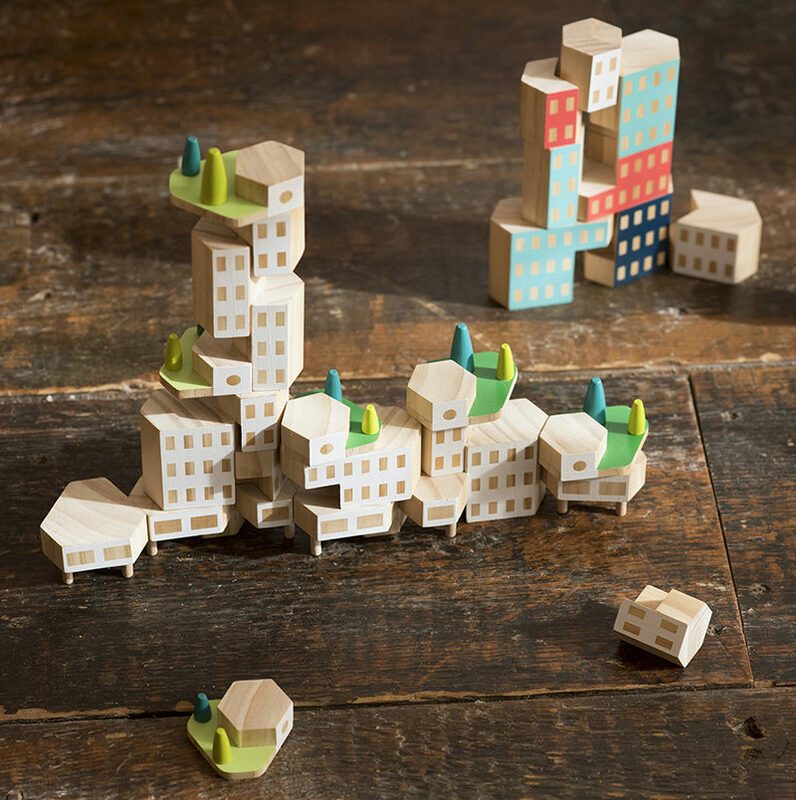 Build cities and knock them down with these durable and uniquely shaped wood blocks that come either with a natural finish or in pastel colors. Blockitecture designed by James Paulius. Available through Areaware. 4. Help your kids learn their ABC’s with these minimal alphabet blocks that be stacked up to make towers or laid out to make words. 5. 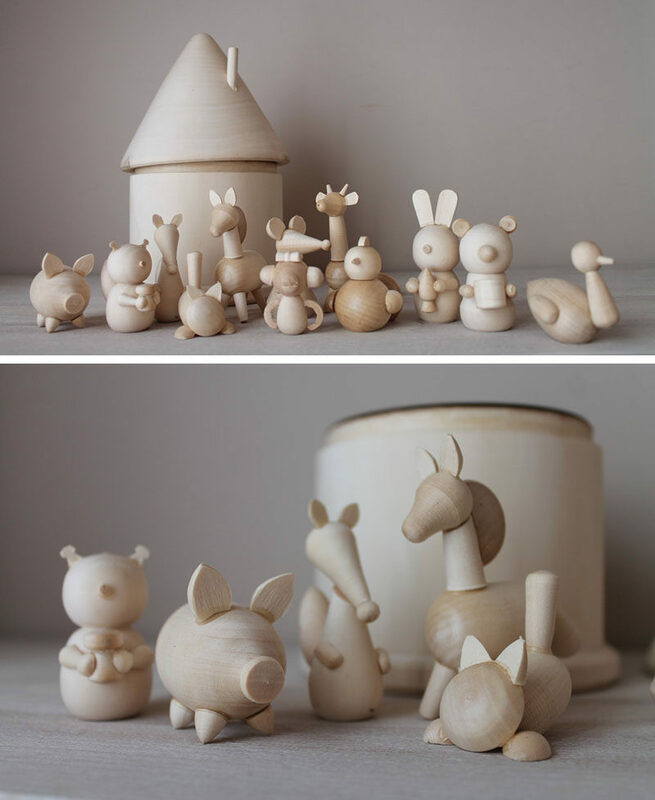 Tiny wood creatures look so much nicer than little colorful plastic people and the expressionless faces let kids use their imaginations more while they’re playing. 6. 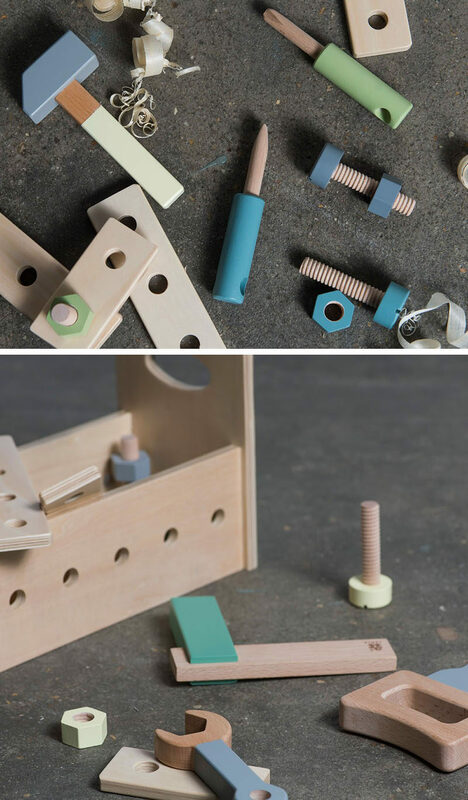 Help kickstart your little architects future with these blocks that were inspired by the contents of real drafting kits. 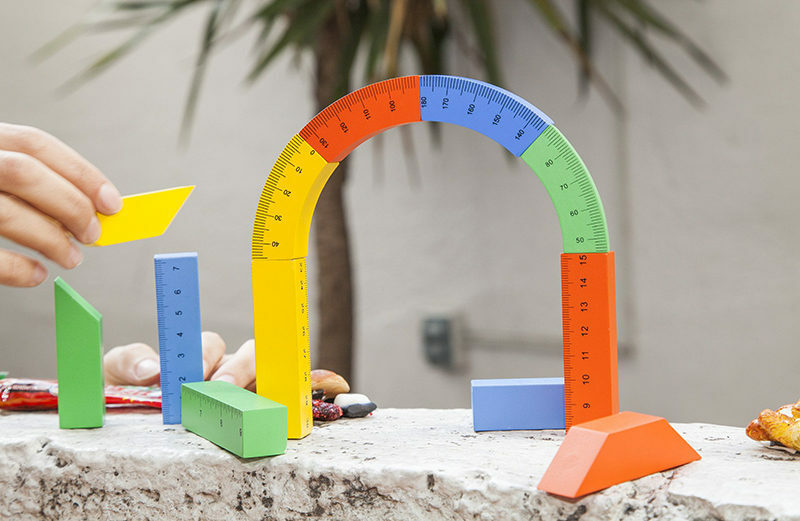 Little Architect Set from Areaware. 7. 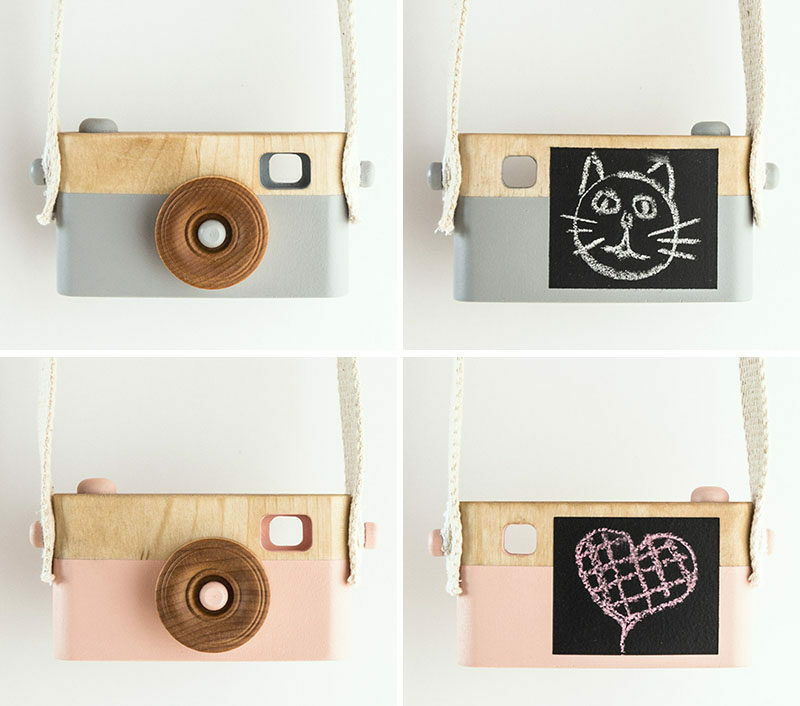 These wood cameras feature chalkboard squares for creating “photos” and have buttons that actually click when they’re pressed. 8. 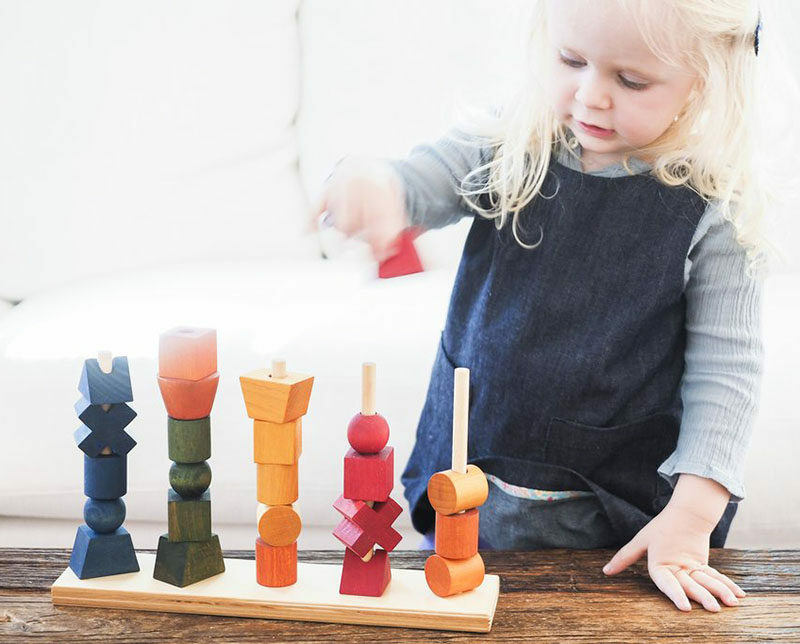 These colorful stacking blocks can be arranged by color, shape, or randomly to create all sorts of patterns and help with fine motor skills. 9. It’s hard to finish DIY projects when tiny helpers insist on helping. This tool kit will let them feel like they’re still helping but will keep them safer and let them have more fun. Wooden tools by Sebra. Available through Smallable. 10. 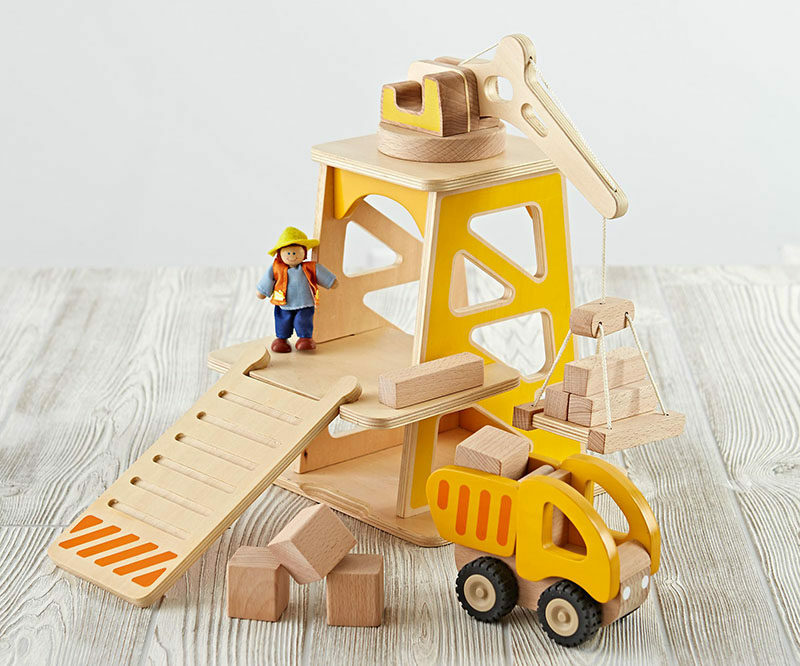 This wood construction set makes it easy to get your daily dose of dump truck without having to turn on the TV or leave the house. 11. 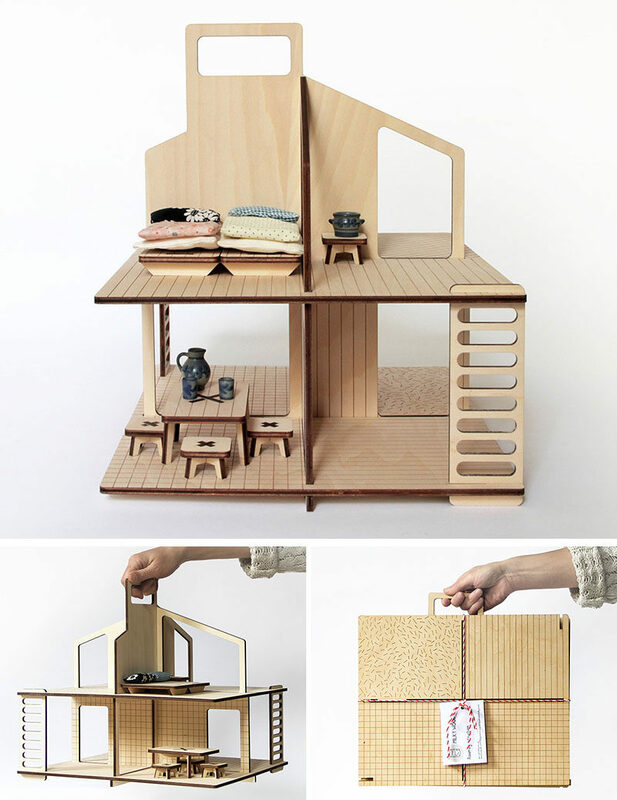 These doll houses are made from plywood and can be packed up for easy transport. They’re also more spacious making it easier for grown ups to get their hands in there too. 12. This lacing sheep is a great gift for the creative kids who like trying new things and working with their hands. 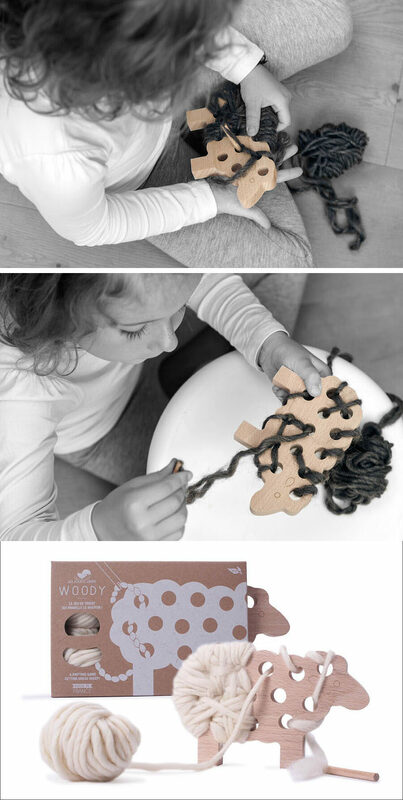 Woody Lacing Sheep by Les Jouets Libres. Available at Smallable. While wood is good most of the time, sometimes you just want to cuddle with a stuffy. 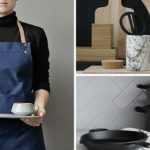 These next few items are perfect for doing just that. 13. 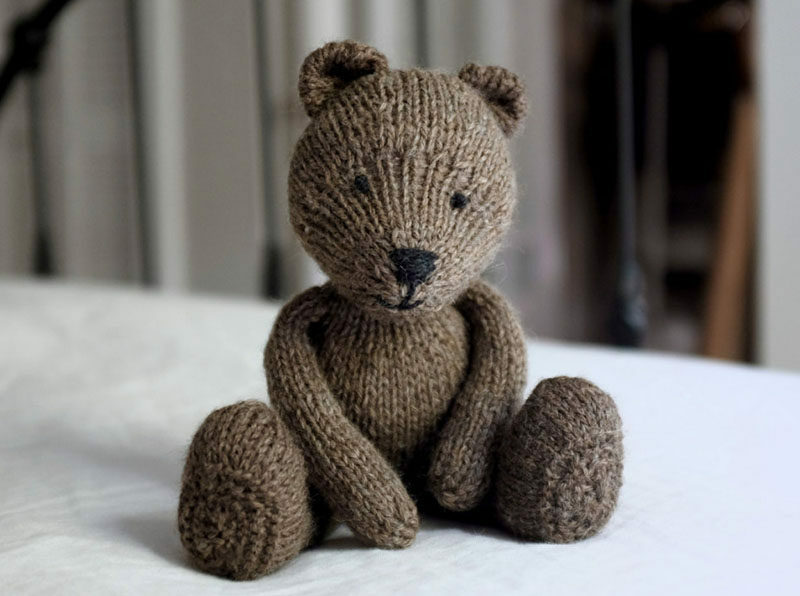 This hand-knit bear is just the right size to carry around all day and is soft enough to cuddle with at bedtime. 14. 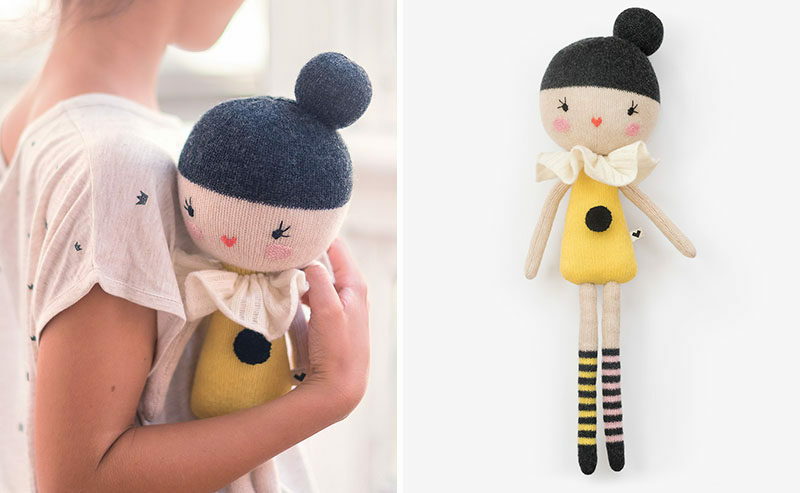 Stuffed dolls are a great way to teach kids how to be loving and nurturing and can also be used to make scary things feel less scary. 15. 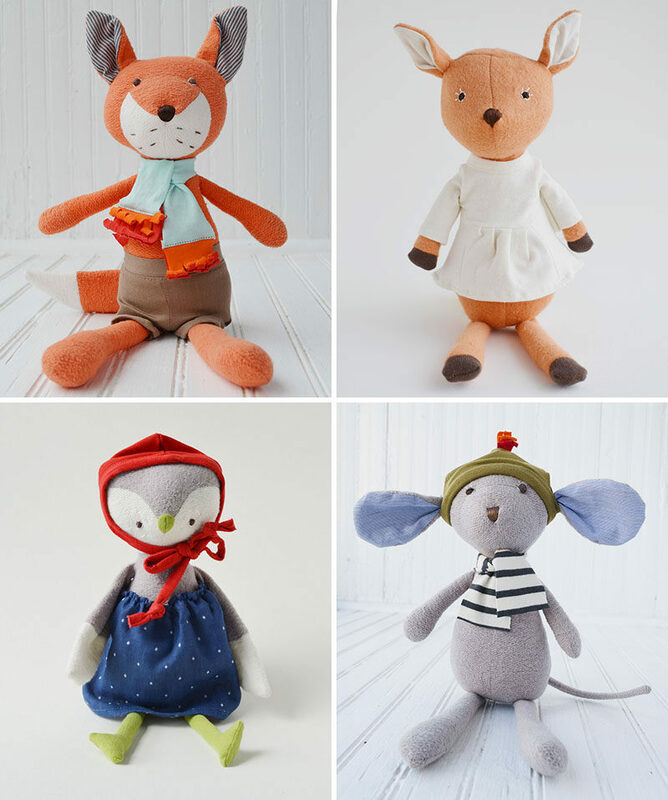 These woodland creatures are adorable alternatives to the everyday stuffed animals found on most store shelves. While bath time is already fun for most kids, adding a few toys to the mix can make it that much more fun and creates more opportunities for the little people to use their imaginations. 16. 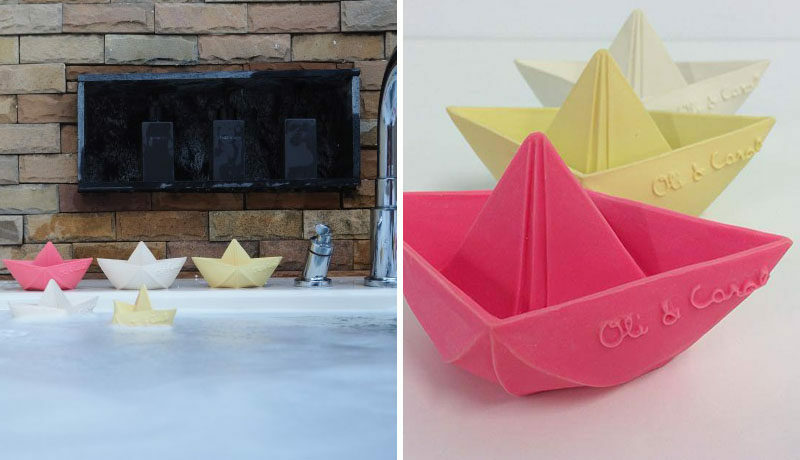 These little origami boats are made from natural, biodegradable latex allowing them to float freely around in the tub and are easy to clean, preventing the growth of mold or mildew. Origami boat bath toy by Oli & Carol. Available at Tiny Crane. 17. 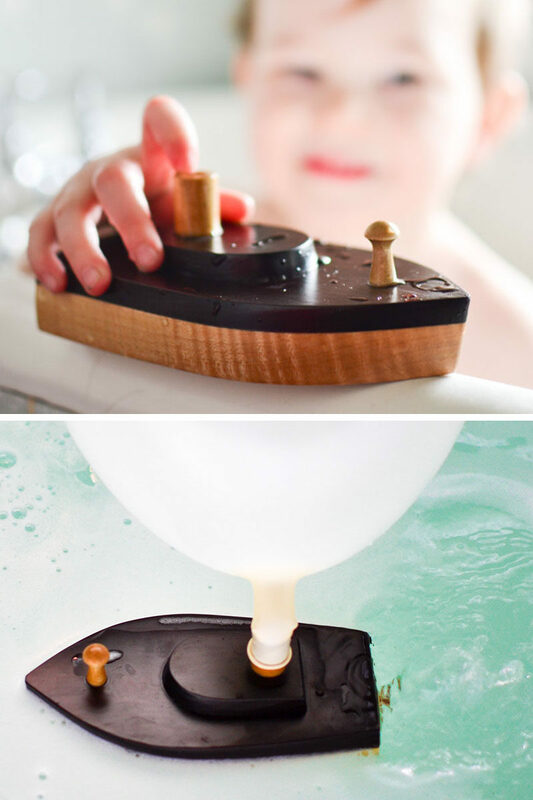 These bath-friendly wood boats are powered by balloons! Blow one up, attach it to the top, and watch as the boat gets propelled in the water. Balloon-Powered Wooden Toy Boats by Adventure In A Box. It’s no secret that kids these days know their way around technology. Before they can even walk or talk, babies are in complete control of the tablet and phones. Here are a few tech gifts for kids that encourage them to do more than sit in front of a screen. 18. Wearable tech isn’t just for adults. 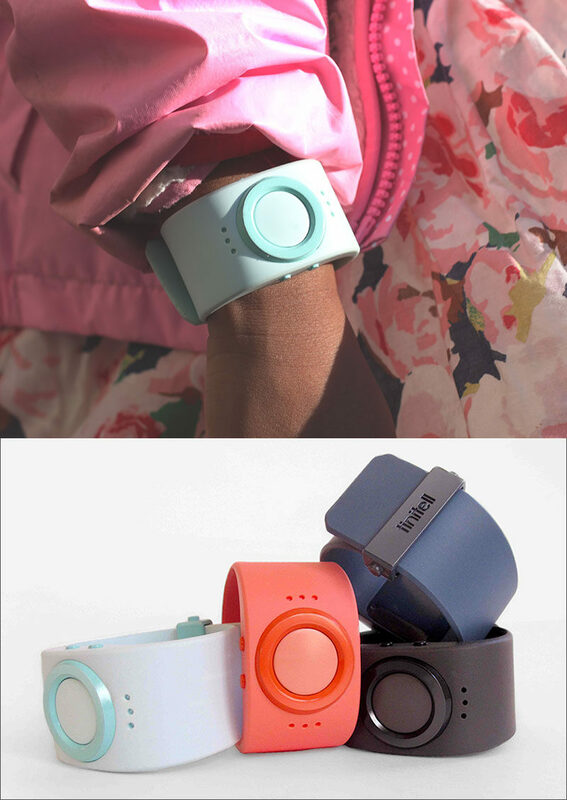 These bracelets are actually wearable mobile phones designed to keep your kids independent but connected. The bracelet connects to an app on your phone which lets you pre-program numbers that your child can call and tracks the location of the bracelet so you always know where they are. 19. If your child loves computers and is up for a bit of a challenge, maybe they should build one for themselves. 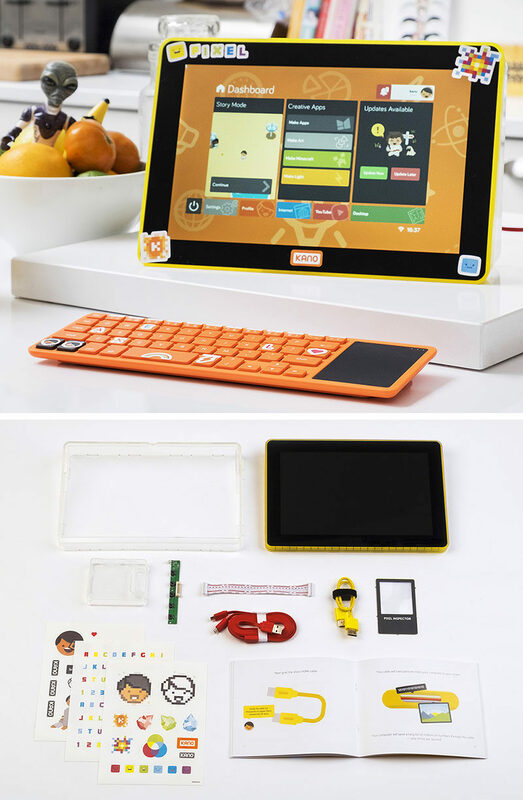 These kits come with everything you need in order to build a screen and a computer and include instructions for coding your own apps, games, music, and art. 20. 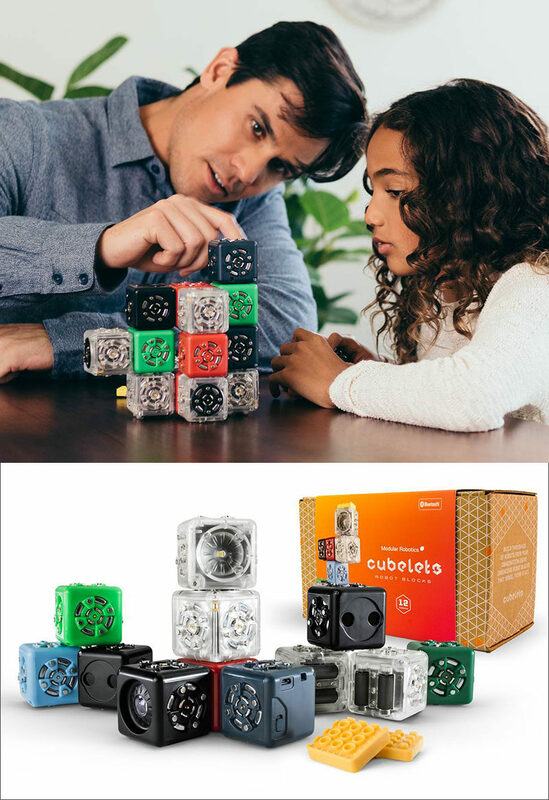 Unleash your child’s imagination with these tiny cubes. Each cube has a different function and can be snapped to other cubes to create mini robots and devices that they are in control of. 22. If your child isn’t quite ready for pedals, these balance bikes are a great way to get your kid moving and working on their biking skills. 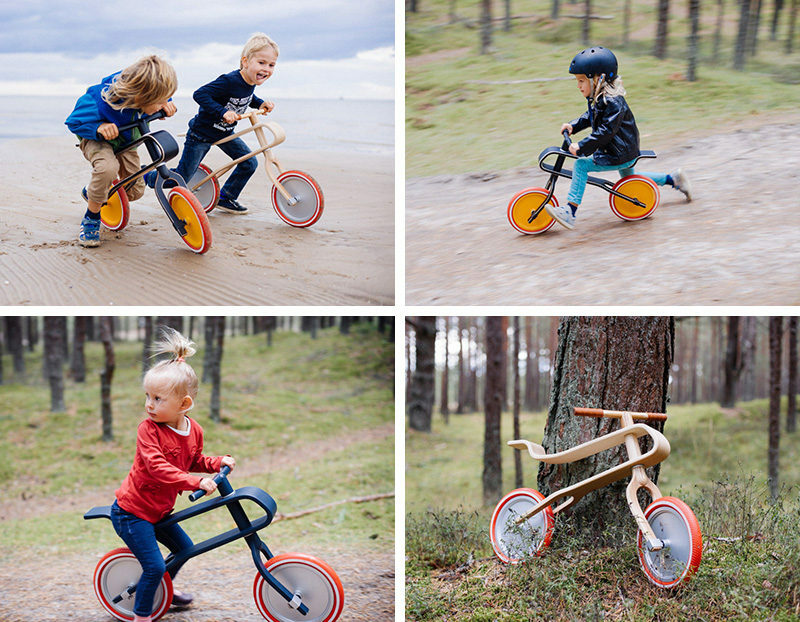 See more of this wooden bike, here. Designed by Brum Brum Bikes. 23. 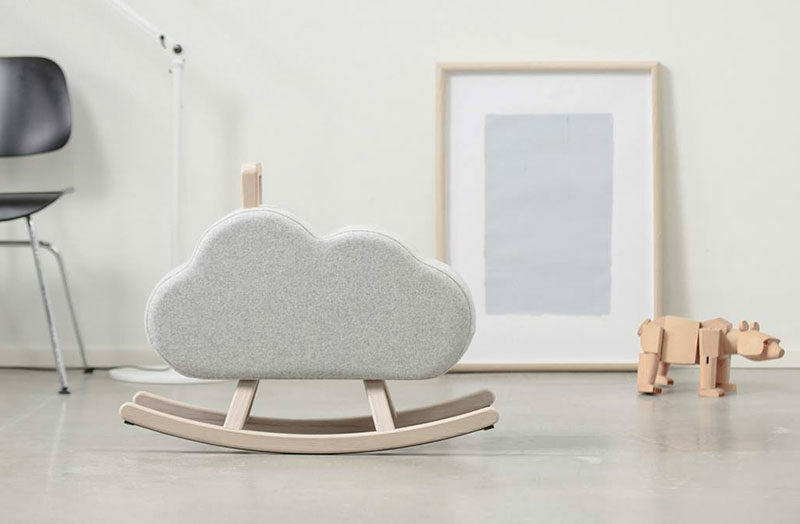 This minimal rocking cloud is a simple and stylish alternative to the traditional rocking horse. 24. This modern rocking horse features a soft felt seat, metal foot rests, and handle bars to create a comfortable rocking experience that also looks nice when it isn’t being used. 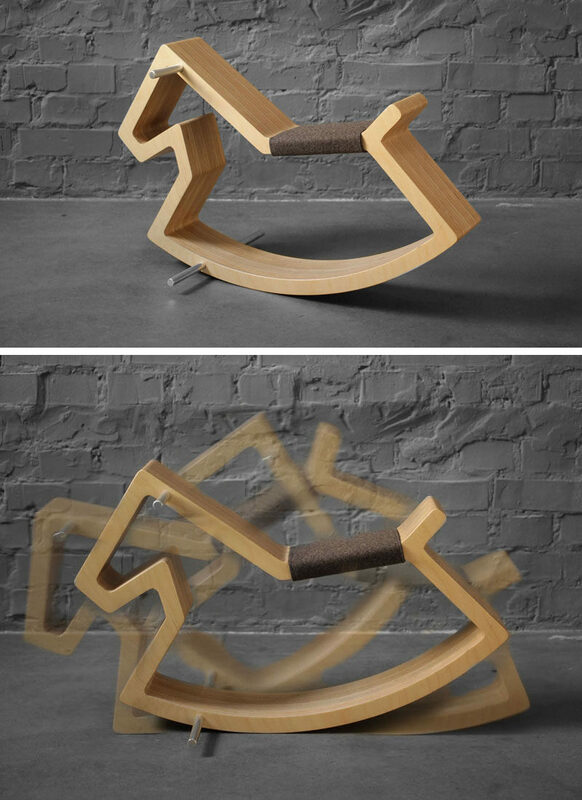 Rocking horse No.1 by Object No. 25. 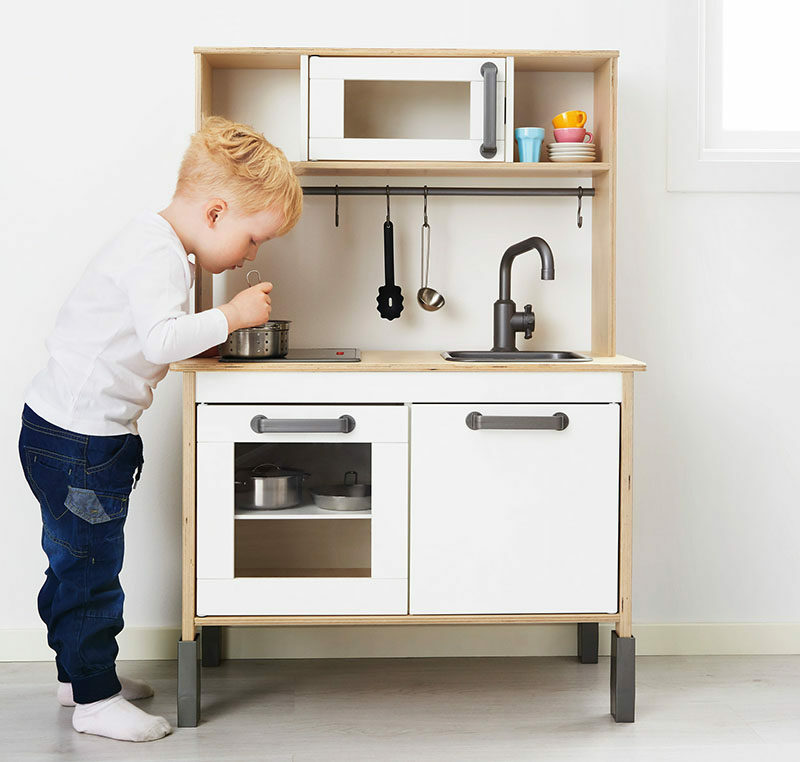 A small kitchen set like this one gives kids an opportunity to be just like the adults they see in the kitchen, and might even keep kids occupied long enough to make dinner prep easier. 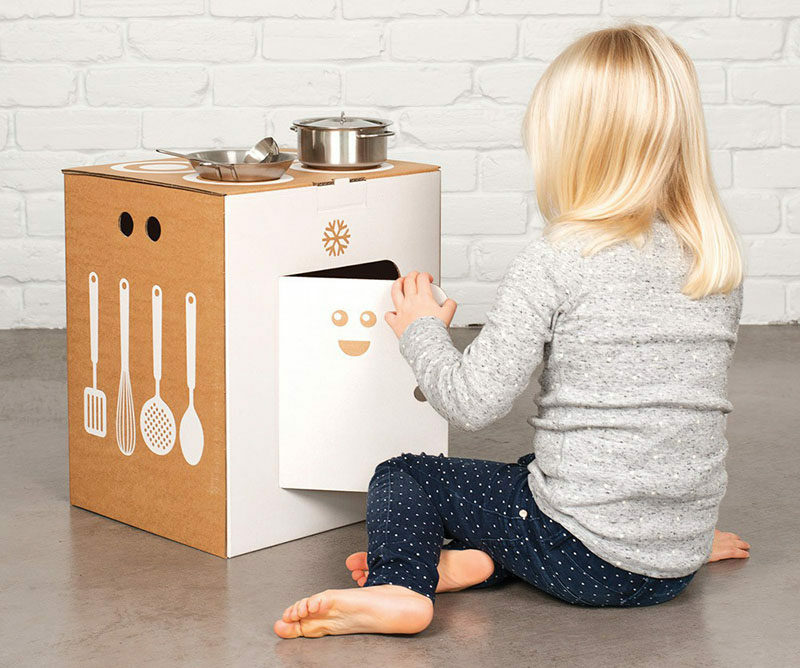 DUKTIG Play kitchen from Ikea. 26. If a large kitchen isn’t doable in your house or apartment, a cardboard one might be. They’re quick to set up and can easily be taken apart to put away at the end of the day. Cardboard stove by Flatout Frankie. Available at Smallable. 27. A small workbench is the perfect gift for the future carpenter. With spots to hang their tools, a wood saw, and a chalkboard for drawing up plans, your kid will be busy building all day long. 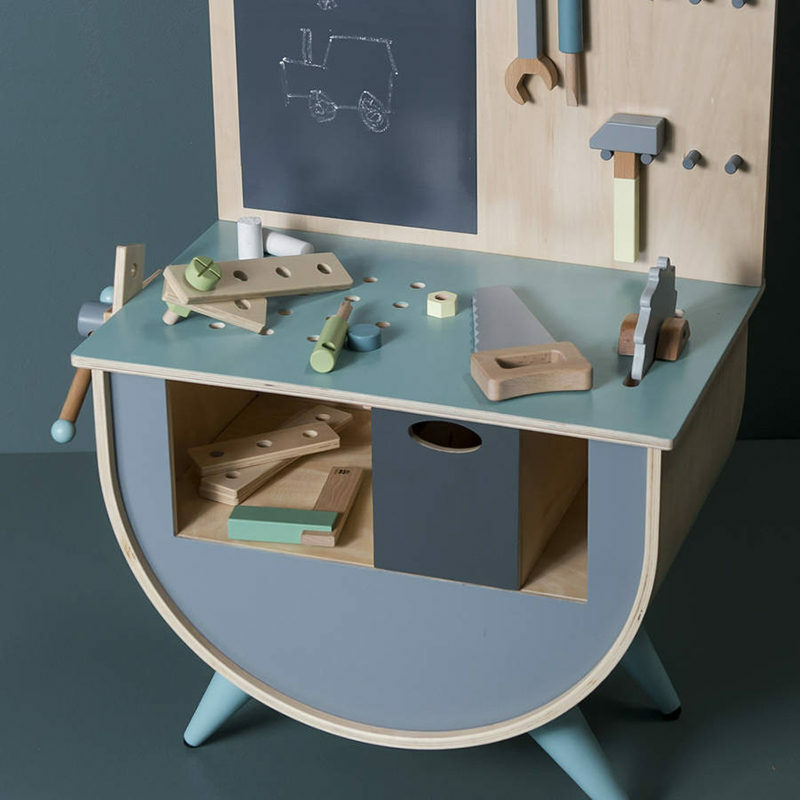 Blue workbench by Sebra. Available at Smallable. 28. 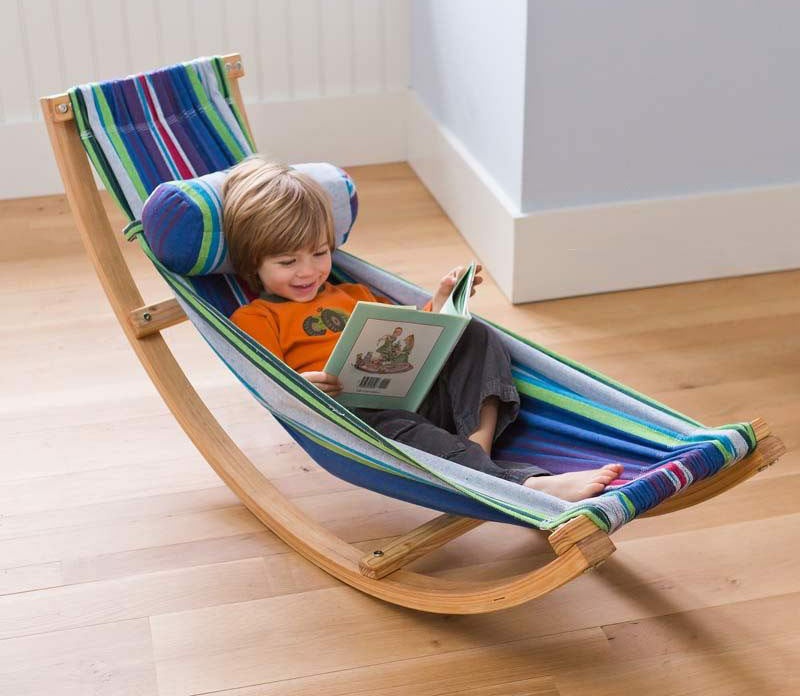 Encourage kids to pick up a book and hang out for a while on their own with a comfy rocking hammock that’s just their size. Playing pretend is made so much easier when you have the proper attire. It’s much more fun to roar like a dinosaur when you actually look like a dinosaur and it’s much easier to rule a kingdom when you’ve got a proper crown on. Here are a couple of fun gifts to take pretend play to a whole new level. 29. Bring back the dinosaurs with a dinosaur outfit that your child can wear all the time. 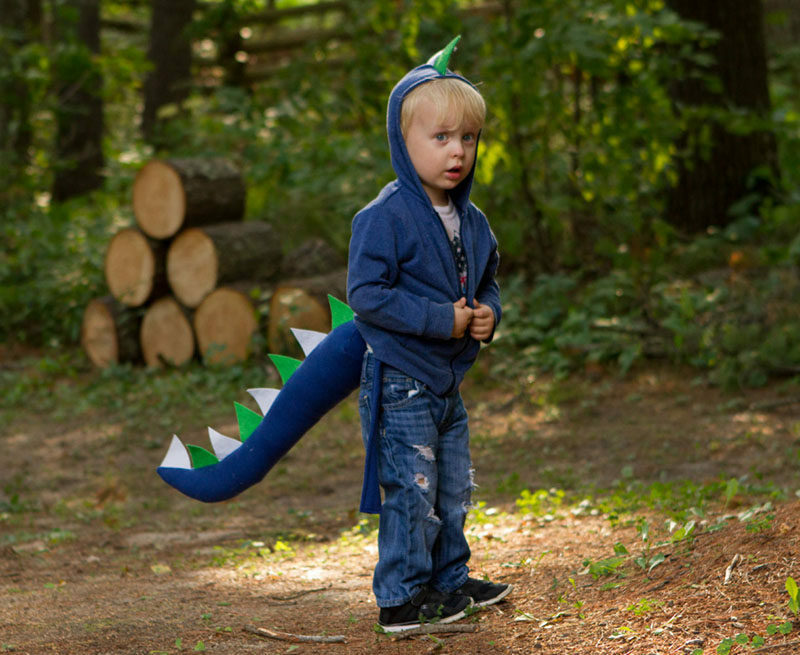 Dinosaur hoodie and tail from Joyful Adventures. 30. 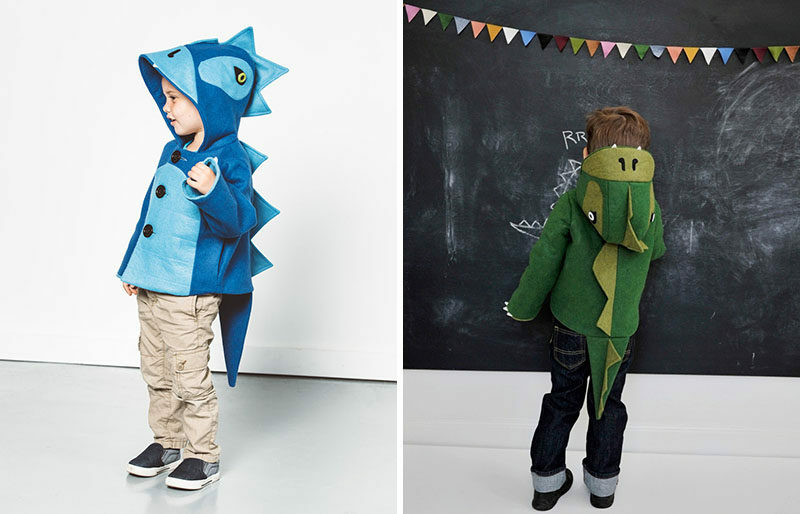 Make getting out the door easier with these wool dinosaur jackets. Putting on a coat is way more fun when it turns you into a prehistoric creature! 31. 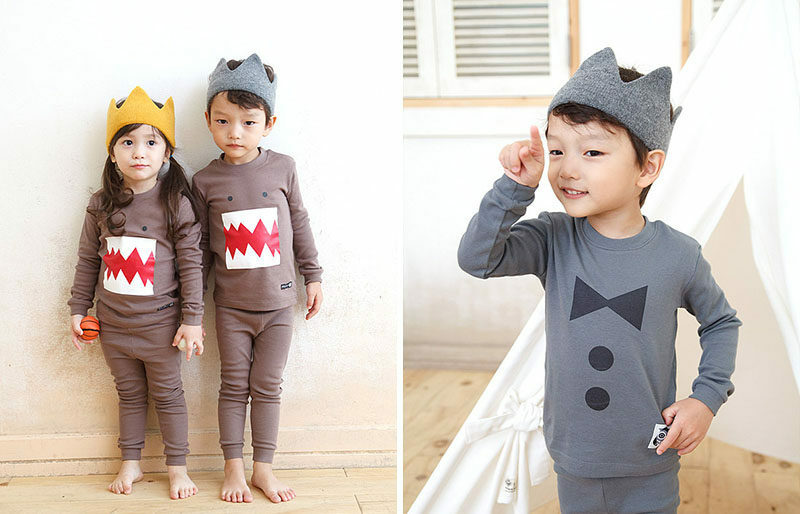 These soft knit crowns ensure that your prince and princess are fit to rule to playroom. Teaching kids how to save money is one of the most valuable lessons you can teach them. 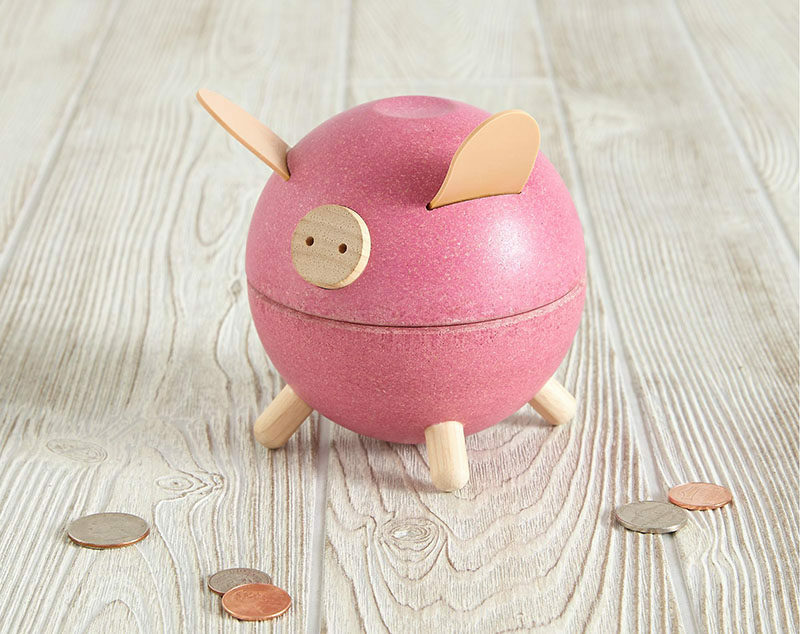 Start them young with a money bank that gives them the satisfaction of dropping in coins and listening them rattle around. It’ll encourage them to save their money and makes it more fun than simply giving it to mom or dad to hold onto. 32. 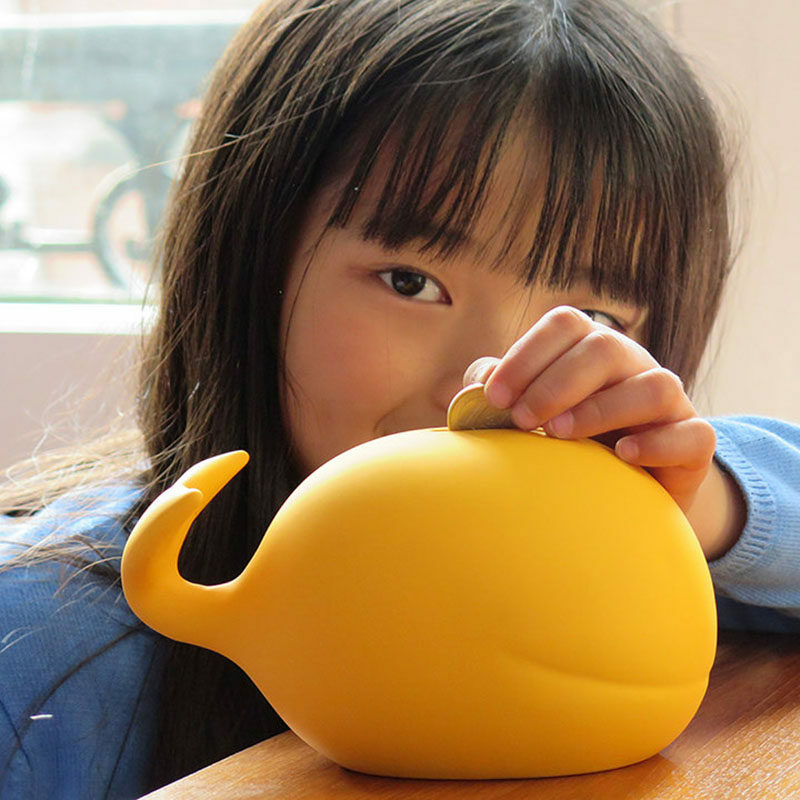 This matte yellow whale bank looks great while letting your kids save money. 33. This fun and quirky piggy bank twists open to reveal how much has been saved. 34. 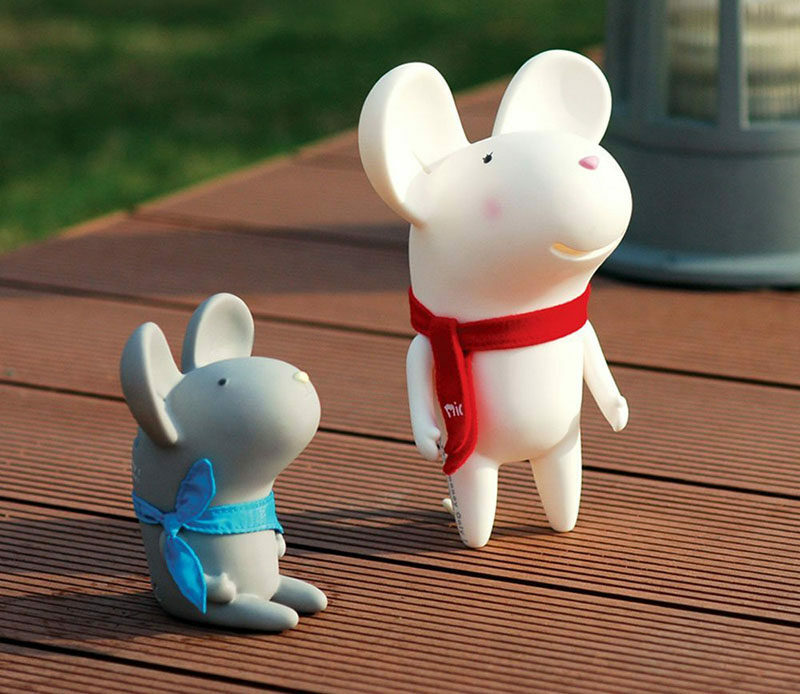 These fun and cute characters help your kids save money, liven up a shelf and could easily double as toys. Standing Mouse by Baidecor – available on Amazon.